During the summer 2015, 900 people who ran away from war, massacres, dictatorships, economical and ecological disasters found refuge in a closed down high school in Paris. The high school Jean Quarré – renamed « Refugees’ House » – was evacuated during the autumn and its residents were scattered all over France. BAAM was created in November 2015 by a group in solidarity with those women and men who are completely neglected by public authority. We are legal experts, teachers, students, social workers, artists, journalists, unemployed people, french or foreigners. We are moved by the same will to welcome, with dignity, all migrant people : asylum seekers, refugees and undocumented immigrants or workers. 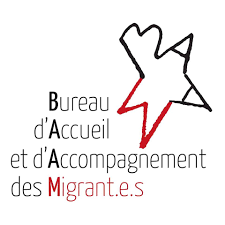 With the project « Bienvenue chez toi », BAAM provides access to French lessons. We are also working with an inter-universities network in order to promote the access to education and to professional insertion. We coordinate conversation workshops, and offer specific lessons for women and unaccompanied minors. We provide free legal assistance to migrants and give to our volunteers a solid background about the right of asylum and the right of foreigners. We provide legal assistance specific to LGBT people, as part of broader actions for the rights of LGBT migrants and asylum seekers. BAAM takes care of proper orientation in the competent health care system, and will work to create a network of supportive doctors able to give free consultations for those who need it. Organization of multi-cultural, recreational and sporting events: picnics, theatre workshop, concerts, movies, museum visits. Find out more here. Weekly assistance in administrative procedures and in the search for housing: asylum seekers, refugees or undocumented people can find help to fill their administrative documents. We can apply for administrative and legal procedures to enforce their housing rights. We provide weekly assistance to refugees with their job search. We help dealing with administrations, companies or training centres, as well as writing resumes and preparing for job interviews. We also help access to common-law institutions through the organization of outings and mediation. Do you speak English, Arabic, Dari, Pashto, Tigrigna, Oromo? Are you a legal expert? A musician? An artist? Can you help in the duty periods for access to employment or for social support? Do you know how to code? Do you draw? Are you motivated to organize concerts or solidarity meals? Do you have a working group project or just time to spend? Join one of the working groups or give us a bit of help. You can also make a donation. BAAM does not receive public subsidies, we only operate through private donations.